Delicious…easy to make…and good for you! Yearning for candy but concerned about its effects on your health? 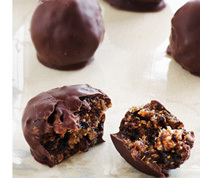 Indulge guilt-free by making healthful chocolate candy at home. You will have control over the ingredients and portion size, so you can get maximum flavor and health benefits with minimal sugar and calories. You probably will spend less than you would at a fancy chocolate shop. And homemade treats make wonderful gifts, too. Top-quality dark chocolate. Chocolate is derived from the cacao bean, which is high in heart-healthy flavonoids (antioxidant-containing plant pigments), as well as iron, magnesium, phosphorus, potassium, zinc, copper and manganese. The higher the cocoa percentage in the chocolate, the more antioxidants it has—but also the more bitter the taste. 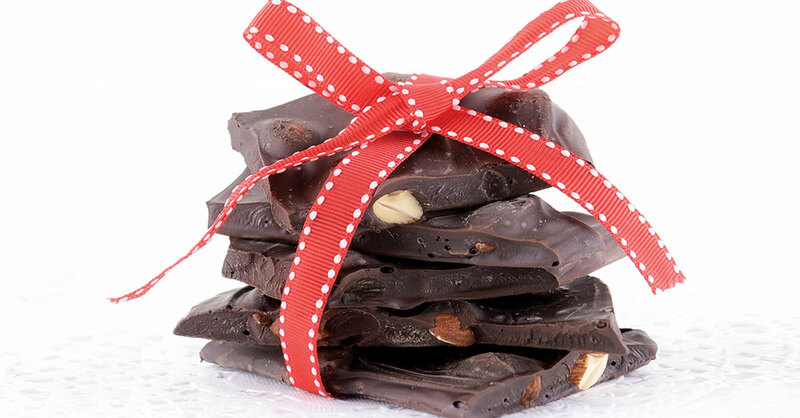 To reap the health benefits with optimal taste, choose dark chocolate containing 60% to 70% cacao. I generally use Scharffen Berger…Ghirardelli…or Green and Black’s. You can get it in bar form or as chips—60%-to-70% dark is comparable to “bittersweet” chocolate. Dried fruits. Yes, dried fruits are high in sugar—but it is naturally occurring sugar, not the refined type. And the drying process concentrates the minerals and the antioxidants. Look for dried fruits with no sugar added. Nuts. Nuts provide healthful monounsaturated fats and omega-3 fatty acids that help reduce LDL cholesterol and triglycerides and also modulate the blood sugar spike that you otherwise would get from the candy. What’s more, nuts fight inflammation, thanks to the antioxidant vitamin E and the soluble fiber that increases production of anti-inflammatory proteins. For these simple treats, start by melting chocolate. Place chopped chocolate in a microwave-safe bowl, and heat on high for 30 seconds, then stir. Repeat the 30-second heating-then-stir process until the chocolate is mostly melted but you still can see a lump or two—at that point, some stirring and the residual heat will finish the melting job for you. For a flavor boost, sprinkle flaky salt, such as fleur de sel, over any of the following while the chocolate is still liquid. Chocolate-dipped fruit: Dip dried apricots, figs and other fruits in melted dark chocolate, covering one-quarter to one-half of each piece of fruit. Place on waxed paper to cool. Super-nutty bark: Melt dark chocolate, spread it about one-quarter-inch thick with a spatula on a parchment-lined baking sheet, and top with three or more different types of chopped nuts. Let set, then break into bite-size pieces. Chunky chocolate squares: Melt dark chocolate. Stir in a combination of chopped nuts and chopped dried fruits—for instance, pistachios plus apricots…peanuts plus raisins…walnuts plus blueberries…hazelnuts plus figs. Pour the mixture into a square baking dish lined with waxed paper. Refrigerate until firm, then cut into squares. In a medium bowl, toss together the almonds and cherries. Line a baking sheet with waxed paper. Melt half of the chocolate in the top of a double boiler or in a small, shallow bowl over a saucepan containing barely simmering water over low heat. (Make sure that the water is at least two inches below the bottom of the top pan or bowl.) Stir until melted. Remove the double boiler from the heat, and stir in the rest of the chocolate until melted. Remove the top pan from the bottom pan, and set it aside. Replace the simmering water in the bottom pan with warm tap water. Put the pan of melted chocolate on top of the bottom pan—this will keep the chocolate at the right temperature while you make the clusters. Stir the fruit/nut mixture into the chocolate. Spoon out heaping tablespoon-size clusters of the chocolate mixture onto the baking sheet, placing them about one inch apart. Place the baking sheet in the refrigerator to cool and set for about 20 minutes, then remove from the refrigerator. Store and serve at room temperature. Makes 12 servings, about 150 calories per serving. Put the figs, ginger, honey and cinnamon in a food processor, and process for about 45 seconds until they are finely chopped and begin to stick together. Roll the fig mixture with your hands into heaping teaspoon-size balls, and set them on a baking sheet or plate lined with waxed paper. Place half of the chocolate in the top of a double boiler or in a small shallow bowl over a saucepan containing barely simmering water over low heat. (Make sure that the water is at least two inches below the bottom of the top pan or bowl.) Stir until melted. Remove the saucepan from the heat, and add the remaining chocolate. Stir until all the chocolate is melted. Remove the bowl with the chocolate from the pan. 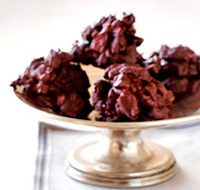 Roll the fig balls into the melted chocolate, one or two at a time, until all are covered. Place them on the waxed paper. Refrigerate for 15 minutes. Remove from the refrigerator. Store and serve at room temperature. Makes 16 truffles, about 65 calories per truffle.